Apple has posted iPhone Update 1.0.2. Available via iTunes. The update only lists "bug fixes" as its description and weighs in at 3.7MB. According to early reports, no new features have been noted. 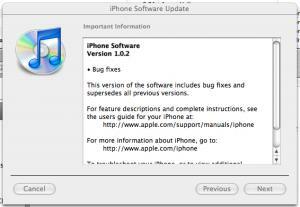 Users who have hacked their iPhone may see problems with their update. In these situations, you may be required to restore to factory default and then update, but you may lose your backups. Users who have only installed Ringtones appear to be safe, with the ability to upgrade normally.